Judging by his F3 pedigree Nigel Mansell is perhaps the least likely World Champion the world has ever seen. As inauspicuous in his lower category years as another surprise top-line driver, Damon Hill, the British Lion finally roared when he grabbed the bait Frank Williams threw at him at the start of 1985. Paired with fearsome Honda power, his first win came after 75 tries (ask Mika Häkkinen or Jean Alesi how that must have felt!) after which he racked out another 30 victories and was only beaten in 1998 by Michael Schumacher as the third most successful GP driver ever. His debut came in 1980 at the Österreichring, when he was brought in as a third driver next to Andretti and De Angelis. The facts say it was an uneventful first Grand Prix for a future World Champion: he qualified 24th in the old 81 and retired with engine trouble. But the Lotus test driver made a lasting impression on team owner Colin Chapman by driving his entire race drenched in fuel leaking from the tank behind his back! This was the stuff Chapman loved and they were to become close friends the following years. So after Andretti left at the end of 1980 Nigel was given a full-time ride alongside Elio De Angelis. 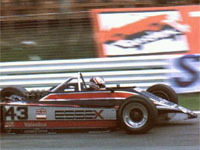 In the following years, he showed spirit and determination - lining up third at Monaco in 1981, scoring a few podiums here and there, clinching his first pole on the emptied dustbins in the streets of downtown Dallas - but was hit by bad luck more than his team leader, the consistent De Angelis finishing third in the Championship twice on the trot. His fast race laps made Frank Williams notice him, however, and when Jacques Laffite admitted to failure in his second Williams adventure and Derek Warwick declined on the offer, Nigel was brought in as a solid backup to Keke Rosberg. But while Keke notched up Williams-Honda's first win, it was Mansell who flew the Williams flag by the end of the year, rising to the occasion at Brands, followed up by a dominant win at Kyalami after profiting from his team mate's bad luck. After Brands Hatch a new Nigel Mansell arose: a fierce, balls-out competitor with an above-average will to win. This win-or-bust attitude endeared him to such crowds as the tifosi, the IndyCar public and the whole British nation. After his back-to-back championships in F1 and CART, it seemed the old Mansell had returned: unfocused, inconsistent, even lacklustre at times. Between 1984 and 1994 it was mostly wins with the occasional bust-up. Before and after this decade of success, we saw flashes of brilliance, but wins were non-existent and embarrassing moments - with his exclusively built MP4/10 and in the BTCC Ford - we saw aplenty.